The Drainage system is an integrated system of tributaries and a trunk stream which collect and funnel surface water to the sea, lake or some other body of water. The total area that contributes water to a single drainage system is known as a drainage basin. The flow of water through well defined channels is known as drainage. These channels draw out their paths in different directions and develop corresponding patterns depending on a number of factors such as nature and structure of rocks, geology, slope, velocity and volume of flow, topography etc. A network of defined channels is called drainage system. It is also synonymous to the river system of an area. The boundary separating one drainage basin from the other is called watershed. 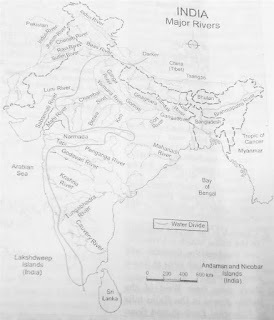 Usually, the catchment areas of large rivers including tributaries, and sub tributaries are known as River Basins, whereas those of smaller streams are also referred to as watersheds. River basin is considered as the basic hydrological unit for planning and development of water resources. Drainage system has been broadly divided into two types. It is the system which follows the regional slope and geological structure of an area. Sequent drainage system can be further divided into four types. i. Consequent Stream: It developed in any area in accordance with the initial slope, present in that area. ii. Subsequent Stream: It developed after the consequent stream and joins it at a right angle. iii. Obsequent Stream: Obsequent stream moves in the opposite direction to consequent stream but join it at a right angle. It is the system which does not follow the regional slope or geological structure of an area. The spatial arrangement of a stream is known as drainage pattern. All rivers are joined by smaller rivers or streams which are called tributaries. River System often forms a distinct pattern which is due to the structure of the rocks in the drainage basin. There are four distinctive patterns which can be recognised as follows. 1. Dendritic: This Pattern resembling the branches of trees with its branches and Sub-branches. Dendritic Patterns are generally formed in the area of uniform lithology or in the area where folds are significant. Rivers in Northern plain follow dendritic pattern. 2. Trellis: When the primary tributaries of rivers flow parallel to each other and secondary tributaries join them at right angles the pattern is called trellis. The old folded mountains of the Singhbhum (chhotanagpur plateau) have drainage of trellis pattern. 3. Radical: The drainage pattern in which the rivers originate from a hill and flow in all directions is called radial pattern e.g. 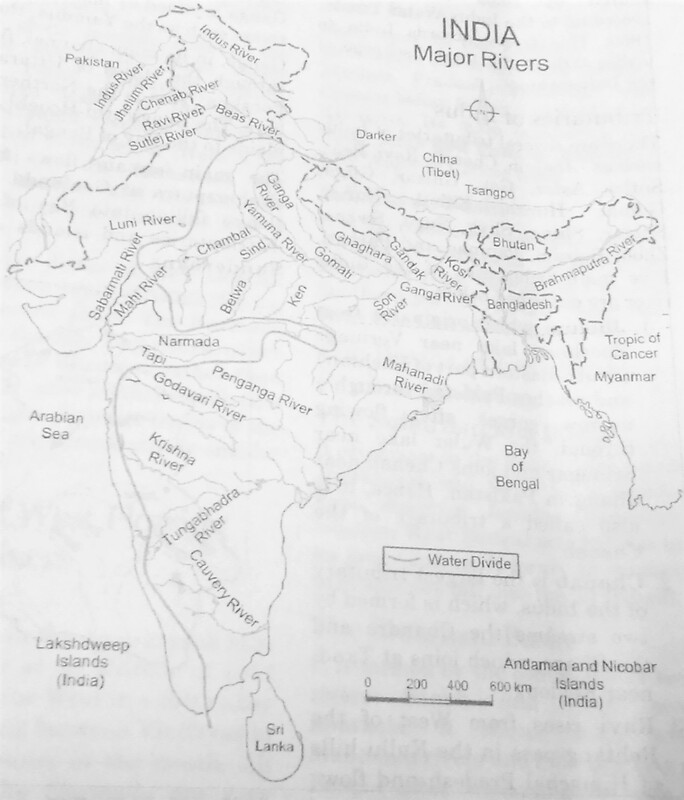 rivers originating from the Amarkantak range. This pattern resembles the spokes of a wheel. 4. Centripetal: When the river patterns discharge their waters from all directions in a lake or depression, the pattern is called centripetal.